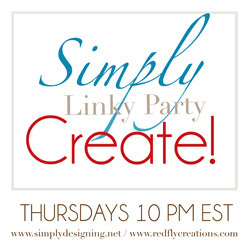 Thank you so much for stopping by to link up at our Simply Create Link Party! Don't forget to check out the blogs that were featured on Monday afternoon HERE. There were some amazing link-ups so it was really hard to choose, but you don't want to miss these ones that we featured so pop on over and check them out! Thanks for the party, Melissa! So happy to join you!! Thank you so much for Hosting Melissa and also for linking up with us at Bewitch Me & Titi! Thank you for hosting. Have a lovely day! Thanks so much for the party! All your work is definitely appreciated!